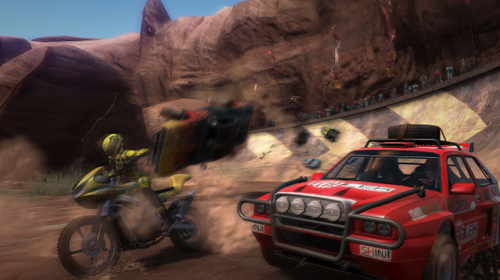 MotorStorm was THE game to own upon the release of the PS3. It had everything that a next gen game should have, including great AI for the other drivers and also great graphics. The game consists of a fictional set of rough and ready races, which take place in Monument Valley. The objective is to finish the race within the top three places to be able to progress to the next track. There are a few tracks in each subset of races, and each of these has to be completed in order to unlock the other sets of races. The player must do whatever he/she can in order to rein victorious in each of the races, this involves smashing other players into cliff walls, or over a cliff edge. The satisfaction gained from doing so, especially in an online match will put a grin from one side of your face to the other. There are several categories of cars to consider before getting into a race, each with their own unique way of handling. These consist of ATV’s, big rigs, rally cars, racing trucks, buggies, mudpluggers, and finally my favourite, motorbikes. Each track is very different from the last one, consisting of sharp turns, large jumps, mud pits, cliffs, broken bridges and the like, each placed carefully to make the player think about how to best cross the obstacle while driving at high speed. 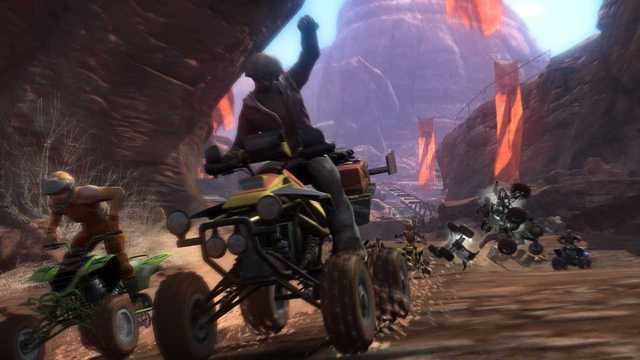 The player must try to use the boost capability of the vehicles to climb further up the race ladder. The boost facility is great as long as it is not over used, if however you do use it too much, the engine will overheat causing you to explode into a ball of flames. Motorstorm should have a place in every PS3 owners collection, not only because it was a revelation when released, by introducing a lot of people to their first next gen experience, but also because it is a great game in it’s own right. We here at PS3pad.com cannot recommend this game enough, so if you are on the fence about whether to purchase or not, then our advice would be to go for it. Previous story PS3 Greatest Hits?